A tall bookcase—and an artful display of books, objects and photos—adds interest and depth to the room. Homeowner Betsy Flaim follows Langdon’s lead on how to spruce up her existing sofa. Photos of New York City architecture—which Langdon took from atop the Plaza Hotel—are used to great effect on a formerly bare wall. 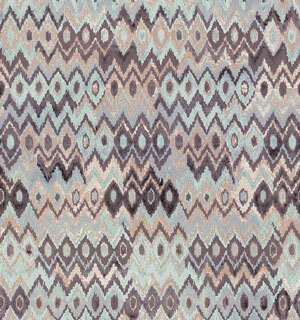 Flame Stitch pattern from Kravet Couture that launched the room’s design direction. “Splurge on big moments in the room,” such as upholstery, which you will be sitting on the most and where you will not want to cut corners on comfort and construction. How to save? If you can, choose from among the thousands of fabrics manufacturers typically offer in their upholstery line, which will save you from tagging on additional costs. For instance, if using a customer’s own material, “one chair could take six to nine yards worth of fabric depending on what the repeat is, which can really up the price on things.” In the case of the flame-stitch fabric the homeowner loved (but used judiciously on accent pillows and ottomans) “it was worth spending the money” because it was a “connector fabric” that tied the color scheme together.